The Republic of Serbia is a democratic state of all its citizens. Its history and achievements make it an integral part of modern civilisation. Apart from Serbia Proper, the Republic of Serbia contains two autonomous provinces: Vojvodina and Kosovo-Metohija. Belgrade is the capital of Serbia. With a population of 1.6 million, it is the country's administrative, economic and cultural centre. Serbia is located in the central part of the Balkan Peninsula, on the most important route linking Europe and Asia, occupying an area of 88, 361 sq. km. Serbia is in the West European time zone (one hour ahead of Greenwich time). Its climate is temperate continental, with a gradual transition between the four seasons of the year. The ethnic composition of the population of the Republic of Serbia is very diverse, which is a result of the country's turbulent past. 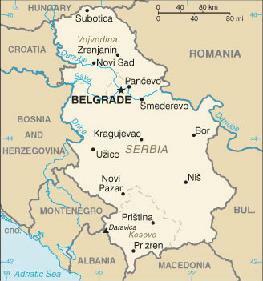 The majority of the population of Serbia are Serbs, but another 37 ethnicities also live on its territory. All citizens have equal rights and responsibilities and enjoy full ethnic equality. The population of Serbia is 7,498,001. Serbs make up 82.86% of the population, Hungarians 3.91%, Bosniaks 1.81%, Roma 1.44%, Yugoslavs 1.08%, Croats 0.94%, Montenegrins 0.92%, Albanians 0.82%, Slovaks 0.79%, Vlachs 0.53%, Romanians 0.46%, Macedonians 0.34%, Bulgarians and Vojvodina Croats 0.27% each, Muslims 0.26%, Ruthenians 0.21%, Slovaks and Ukrainians 0.7% each, Gorani 0.06%, Germans 0.05%, and Russians and Czechs 0.03% each. The official language in Serbia is Serbian and the script in official use is Cyrillic, while Latin script is also used. In the areas inhabited by ethnic minorities, the languages and scripts of the minorities are in official use. The main religion of Serbia is Christian Orthodox. Beside the Christian Orthodox Church, there are also many other religious communities in Serbia: Islamic, Roman Catholic, Protestant, Jewish are just some of them.